make a precise facts-checking about the IBLs, considering the amount of wrong/incomplete infos one can retrieve surfing the web. What follows took me almost a whole year of work, extensive fact-checking, intensive research at the archives of Naim Audio etc. The Naim Audio IBL is a diminutive floorstanding tower, designed by Roy George of Naim back in 1987, when tiny and slim towers weren't all the rage like nowadays. Instead of a tiny floorstander that tries to mimick a full size loudspeaker, the IBL should be tought as an "extended bass" minimonitor . What's in a...naim. The model name IBL was chosen among a couple of alternatives: SOSBL (Son of SBL) and BL1 (Box Loudspeaker 1, that is to say the first "boxed" loudspeaker by Naim). At that time Naim was making the SBL (Separated Box Loudspeaker) which was a very particular design featuring three different cabinets stacked one above the other. From top to bottom, the first one was the tweeter enclosure, the second was the woofer enclosure and the third one acted as an acoustic resistance chamber for the woofer load. Naim Audio wanted to make a loudspeaker based on the very same principle, just smaller in size and with the three chambers integrated all in one. That's why, at the end of it all, the name became IBL (Integrated Box Loudspeaker). If you take a look at the cabinet of the IBL you won't notice the three chambers feature like in the SBL. Actually, from the outside, the IBL cabinet appears absolutely traditional. Instead, the three chambers have been hidden at the inside of the cabinet. More precisely: the IBL is an acoustic suspension design which makes use of two separated enclosures for the woofer acoustic load. This way the acoustic impedance seen by the woofer membrane behaves linearly and hence the woofer motion can be easily (more) controlled. The tweeter "lives" inside a small separated enclosure, so to be completely isolated from the vibrations coming from the woofer motion. Since this wasn't enough for Roy George, he decided to install the tweeter by means of a kind of spring-suspension. A close look at the tweeter baffle will reveal the trick. Instead of being rigidly screwed into the cabinet, the tweeter is suspended by means of flat springs that leave it free to "float". This way, vibrations propagating along the cabinet front baffle are greatly attenuated before reaching the tweeter. Now, without a separated, closed and sealed enclosure for the tweeter, this kind of "floating" installation would have affected the acoustic load of the woofer. Just two words about the tweeter unit. 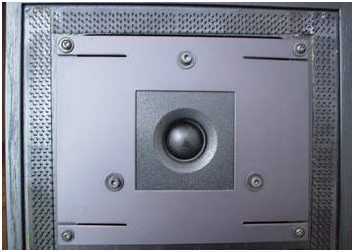 It was a Scanspeak D2008, the very same used in the SBL, slighly modified by Naim with a feature called mass damping. The tweeter unit has its own resonancy nodes which can be harmful in terms of colourations of the sound. Hence, Naim applied a small brass and bronze mass at the rear of the magnet. Position, size and weight had to be precisely calculated in order to minimize the tweeter structure resonancies. This tweeter equipped the IBL during the entire life of the model, no changes or upgrades were made to the unit. The differences between different versions of the IBL were determined mainly by the woofer unit. So....here we go with it! Things get quite intricated when dealing with different versions of IBLs and IBL woofers. In 1992 the unit was substituted with a new one and the IBL became IBL 2 or IBL mkII (or mk2). Before 1992 the loudspeaker was/is known as IBL, IBL 1 or IBL mkI. Some swear of a legendary IBL mk III but Naim heads don't confirm this, though there is some reason behind this "third" release of the IBL as we're going to discover in a couple of lines. 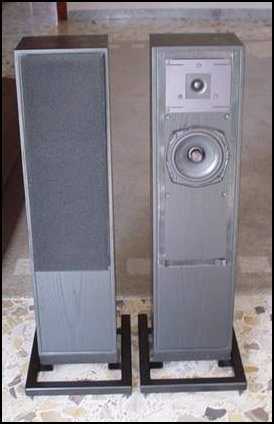 Between November 1987 and March 1991 the woofer unit was supplied by Electro Acoustics (commonly known as Elac). Subsequently Elac was bought by Harmon and then closed. Naim Audio bought a large stock of Elac woofers in order to be able to give spare parts to its customers and assure proper servicing. From April 1992 till September 1993 the Elac woofer was replaced by the 130NC/B0492 ISSA made by Mordaunt Short. The unit was heavily factory-modified: as you can see in the picture at your right, the dust cap was replaced by an aluminium phase plug, in order to linearize the frequency response and improve heat build-up dissipation. Since September 1993 till the end (1996) of its carreer, the IBL was equipped with a new unit, entirely built by Naim, based on a Dorma chassis made by KEF. The woofers were "sealed" by means of a blue tacky compound. If you find some trace of this material between the woofer and the cabinet, do not remove it, as it is needed to guarantee the air-proof acoustic load. This kind of turbulent woofer history generated some misunderstandings in relation with the release number of the IBLs. Actually, the IBL mkII or IBL 2, released in 1992, included small structural upgrades as well, such as an improved tweeter floating system, a revised metallic stand and a different damping material at the inside of the enclosures. This means one can talk of an IBL mkII only if it has been made after April 1992. Further changes of the woofer unit can't be claimed as mkIII or new releases of the loudspeaker, just refer to them as normal component upgradings every HiFi Company makes to its products during production, either because a particular component is no longer available or because the designer feels the need to slightly improve his design (to keep up with its competitors). It is not uncommon to find IBL mkI's which have been factory upgraded to MkII's. These can be referred as mkII's as well. The cabinet of the IBL deserves some comment as well. You've already learnt it is divided into three chambers and two of these communicate each other to ensure the correct woofer load. The whole cabinet structure is "mass damped" exactly like the driver units. This feature, matched to the diminutive size of each panel and the asymmetrical shape of the cabinet (a trapezoid with an inclined front baffle) make the IBL absolutely free from vibrations. The cabinet sounds absolutely "dead" when knocking on it. Both drivers (woofer and tweeter) are connected to the outside world DIRECTLY, I mean, without crossover network. Two small runs of Naim Naca speaker cables (and Naim bananas) connect them to the external crossover network, called PXO (Passive X-over). The PXO is not a stand-alone completely seprated unit, actually it is hosted inside a small cabinet secured to the back of the loudspeaker. The PXO is secured to the loudspeaker cabinet by means of screws and rubber rings, to ensure insulation from vibrations. There are many reasons for such a bizarre design choice. First of all, the passive crossover can be easily removed in order to make the IBL fully active. Just unplug the bananas that carry the signal from the PXO to the drivers and....bingo!...you get an active-ready loudspeaker in 5 seconds. Two power amps will then drive SEPARATELY the tweeter and the woofer, provided an electronic crossover has been installed in your system (such as the Naim SNAXO). Comparing active driving to traditional passive driving is as easy as it can: remove the SNAXO, insert the Naim bananas into the drivers' sockets and you're done. No soldering iron, no screwdriver, nothing at all. Secondly, an externally mounted crossover is completely free from interactions from the driver units. 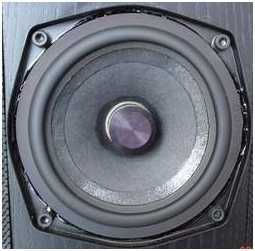 Strong magnetic fields created by the drivers and vibrations generated by the woofer are greatly reduced. As there's no such a thing as a perfect design, this kind of unusual choice creates a couple of problems I'll discuss later on. The IBLs, though being a floorstanding loudspeaker, make use of an integrated (again!) metallic speaker stand. They are meant to work WITH it. The stand is equipped with adjustable spikes to maximize stability and contact even on carpeted floors. This way the usual dilemma "Which stand should I use?" is solved, as the IBLs give their best with their own stand. Note that this is screwed into the loudspeaker cabinet so there's no possibility of catastrophic crashes if one inadvertedly knocks the speaker (good if your home is populated by pets or small children :-)). The IBLs had been tought as scaled-down SBLs, i.e. a "resized" SBL meant for small rooms (...and audiophiles on a tighter budget). As said, they use the very same tweeter unit and share the same design principles....so, if you happen to like the SBLs, chances are you'll love the IBLs. The larger and much more expensive DBLs, instead, use the same midwoofer unit of the IBLs, with a modification in order to make it work better as a "pure" midrange instead of a factotum mid-woofer. To be more precise, the IBL woofer unit has a longer voice coil in order to allow long-throw membrane movements. Externally, they look the same. Few tech notes are available. Among these, let me cite the sensivity datum, claimed to be 86.5 dB/w/m (in room), the nominal impedance, with a minimum of 6 ohm and the frequency response, still in room, claimed to be 45-20.000 Hz ± 3dB. This may sound surprising, if you consider the size of the woofer and the acoustic suspension design, but don't forget the IBL, like most Naim Audio loudspeakers, are meant to be installed as close to the rear wall as possible. This adds a reinforcement to the first octaves of the audio spectrum. Nominal power handling is claimed to be 65 watts. The dimensions of the diminutive speaker are: 80 (H) x 25 (W) x 27.7 (D) cm (make your conversions, lazy non-metric dudes :-)). The front panel, as said, is slightly inclined backwards, to correct phase emission differences between the two drivers. The drivers are computer-selected pairs and so are the loudspeaker pairs, one matched to the other. The IBLs I've tested are of the mkI kind, recently upgraded to mkII status with the new woofers. I've been listening to them for six months so I've had the time and the possibility to experiment with very different partners (amps and sources, what else? :-)). Two rooms have been used, as well, one quite small and well suited for the IBLs and another one which was (too) large. Of course, different Naim Audio amplifiers have been used as well. Let me confess my first approach with the IBLs hasn't been easy. It took at least 15 days of extensive listening tests before their real character became evident and clear to my ears. For a reviewer this is an unusually long period of time, I admit. Normally, after a couple of days, you are able to understand the personality (uh?) of any given HiFi component. Writing a full review is a different thing, though, as this may require several months of tests. Before their sound was completely revealed to me, I couldn't help but complain of their bass limitation. Dry, not-extended, weak, shy ....were the adjectives that kept my mind busy for a long while. After two weeks, things started to become clearer. Indeed, the bass range is quite on the light side but this is mainly due to the complete absence of "overhang" and boominess. The small woofer and the particular acoustic suspension system play an almost magical role here: the bass range is clean, free from colouration (easy to detect on bass-reflex designs, instead) and extremely quick. Just to say it in words the flat earth inhabitants can understand well, the IBLs do have PRaT (Pace, Rythm and Timing) in spades. If you're not familiar with this word and with its precise meaning, try to listen to a pair of IBLs: everything will become clear. These tiny floorstanders show an excellent timing and coherence. Though one may desire some added weight in the bass (yeah I know I'm a bass freak), it is hard to criticize the overall performance. Actually the dryness and lack of weight in the bass is counterbalanced by a truly excellent performance in the mid-high range where the already well-known qualities of the Scanspeak D2008 have been clearly improved by the particular floating installation and mass-damping treatment. Piano and voices, in particular, are reproduced with a sense of realism and presence that is simply astonishing. For example, Enja's sensual voice greatly benefits from the IBLs great transparency and accuracy. Voices always catch listener's attention, thanks to a "presence" effect which is shared by most Naim Audio components. This helps the natural reproduction of strings and cymbals as well, which appear always sparkly and metallic. One may say the sound strongly reminds that of a classy mini-monitor but there's a difference which can't be denied. Many mini-monitors try to sound "bigger" than they really are, by adding weight in the mid-bass region. Not so the IBLs, which remain linear and coherent from top to bottom. For this reaason - considered how a modern mini-tower sounds like - one may find the IBLs excessively dry and unforgiving. Certainly they are not the easiest speakers on Earth, but once one understands their (tough) "mission" the IBLs may become a real reference in small rooms. If you can live with the bass limitations of a mini-monitor but feel the need for a more complete loudspeaker, the IBL may be a candidate to evaluate very carefully. From this point of view the IBLs do what they can. Not much, actually, because there are physics laws that can't be forgotten. The acoustic suspension of a small woofer can't give all the energy required by highly dynamic musical programs, especially if one loves quite realistic sound pressure levels. The long-throw mid-woofer dances in and out with ease and control, but be careful with the volume pot, the IBLs are not meant to be treated with brute force. Hence, it shouldn't come as a surprise the fact that Julian Vereker of Naim Audio (RIP) considered the IBLs his favourite loudspeaker for small rooms. Here, in fact, the max pressure level and the dynamic range can be considered adequate. Move the IBLs in a large room and you will make the small woofer suffer. Do not make such a mistake, these small gems need to be treated gently. This doesn't mean they always sound quick. They can slow down when required...in other words they can respect the right tempo of your favourite Music. They reaction time is excellent and you need to spend big bucks to find a loudspeaker that can rival with the IBLs in terms of tempo'ing. Hence, in the microdynamics department, the IBLs are simply stunning. The anti-vibration treatment applied to the drivers and to the cabinet allows the loudspeaker to reveal any tiny variation in the musical program. They are not boringly analytic, they just respect Music. With the loudspeakers placed close to the rear wall, there's little hope to get a realistic tridimensional virtual image. Indeed, there's no depth to speak of, nada, nihil, nisba, niente, nothing at all! The IBLs can give you a quite good and large two-dimensional image, picturing the rear wall with instruments and singers in a very well focused and precise way, provided there's NOTHING between them and nothing between you and them (as the coincise owner's manual suggests, as well). Moving them far from the rear wall improves things a little bit but the tonal balance becomes to suffer, as the bass range becomes lighter and lighter. Hence, if you're a big fan of large and deep stereo "images" forget the IBLs, they weren't designed to satisfy your needs. Let's start with room placement. Naim Audio strongly suggests to place the IBLs as close to the rear wall as possible. To achieve this, Naim "F" bananas are almost mandatory as these take less room than standard bananas and allow the back of the speaker to be "glued" to the rear wall. Is this really necessary? Absolutely yes, in my opinion. Any other position is a greater compromise in terms of presence, extension and weight of the bass range. In certain rooms some listener may find the bass range adequate even with the speakers placed far from the rear wall. No matter how hard I tried, I always preferred the "back to the wall" position. For sure, small rooms with carpeted floors may allow more degrees of freedom. Several personal trial and error sessions are mandatory. And now a few words about amplifiers matching. The common wisdom among Naimophiles is that you need at least a NAP 250 power amp to drive the IBLs decently. I tend to disagree. Let me remind you that even the Naim Nait wasn't completely out of question as a first partner for the IBLs. With the small Nait, the IBLs were - indeed - the first step into an all-Naim system. My opinion is that the Nait isn't the best partner for the IBLs. Things get better with the Nait 3 or even the NAP 90.3 power amp, though. The higher you move in the Naim power amps hierarchy, the better the IBLs will sound, that's quite obvious. For example, many Naimophiles claim the speakers sound at their best when actively driven by a four-pack of NAP 135s (!!!). Now, this may even be the case but in my opinion the "source-first" concept can't be stressed that far. The cost of 4 NAP 135s, compared to a pair of IBLs, is simply too high. I'm sure one can get better results with a passively-driven pair of SBLs, for example. As for IBLs, I think an active biamping, even with two NAP 140s or 90.3's can give excellent results. Anyway, to everyone his own, just remember that the keyword in HiFi should always be balance. The IBLs do possess a strong personality which will remain virtually unchanged no matter you try to make them sound different, with differently balanced amplifiers. They're not a killer load (6 ohm of minimum impedance are a walk in the park for most amplifiers, even tubed ones! ), They just require quality, power and dynamics, considering the quite low sensitivity. Avoid harsh sounding gear, the IBLs won't forgive you for that. Two words about cables. Though Naim NACA's are THE choice, especially if using Naim Audio amps, one can even experiment with different stuff. I've got good results even with quite simple Teflon®-insulated solid-core silver cables. If possible, use Naim bananas, not because they are the best ever made, just because they will allow you to place the speakers as close to the wall as possible. One further advice: the banana sockets into the PXO cabinet can be easily damaged by repeated brute-force use. Be careful. And now for some easy tweaking! In passive mode, the signal passes through three pairs of banana connectors: one pair for the passive crossover and two pairs for woofer and tweeter connection, respectively. This means an higher than usual contact resistance. Since you'll buy your IBL's second-hand - no other option being available ...yet :-) - try to carefully clean the banana plugs and sockets. Oxidation build-up is quite frequent and destroys the transparence of the mid-high range. You can use de-oxidation specific products, such as the Caig Power Booster I reviewed a while ago, or a similar product. Die-hard Naimophiles will tell you not to use such products as they "destroy Music". To each one his own, again. There are laws of physics that can't be forgotten. The oxidation of electrical contacts can't be cured by repeated plugging-unpligging. This may help, but old oxide will stay here despite your iterated attempts. When using a contact cleaner/conditioner, you'll be surprised how much dirt lives inside the banana sockets. The upgrade in terms of precision and transparency is something that can't simply be denied. Repeat the de-oxidation procedure periodically. At the same time, inspect the metallic stands and tighten all the srews that hold them in place. These are exposed to vibrations, hence you may need to check them often. Apply the same care to drivers' screws. DO NOT OVERTIGHTEN!!! As said, the passive crossover is installed out-board by means of screws and rubber rings. The stock rubber rings don't offer sufficient damping, in my opinion and, of course, tend to stiffen with age. Replace these with thick and soft O-rings to maximize vibration-damping. If you're confident with your DIY skills you can even think of applying two damping sheets inside and outside the crossover cabinet. This modification improves damping and is reversible. Buying advices. Hunting for a pair of second hand IBLs isn't an easy task. They are quite rare and owners don't sell them easily. E-bay auctions and UK stores are the first places to investigate. Do not expect extremely low prices, though. For a mint conditions pair, boxed into the original Naim Audio box and supplied with the original owner's manual, I'd expect to pay around 700-800 Euro/$, depending on whether it is a mk I or a mk II model. The new mk II woofers are still available (year 2003) and cost 95 GBP each + VAT + shipping (not cheap, uh? :-)). This means that if you're planning to buy a mk I version in order to upgrade it to mk II status...perhaps you'd better search for a mk II model instead. Don't forget to ask for the serial number! As for any other Naim Audio component, this number can be put in direct relation with the year of production. This will allow you to tell whether one is a mk I or a mk II model. Also, if you're lucky enough, you'll be able to "trace" the history of the pair, factory repairs, servicing, upgrades etc. One final advice for the IBLs serial numbers. Considering these were sold as matched pairs, the serial numbers should differ by one digit only (for example: 58331 & 58332). Before buying, closely inspect the dust grids. As these are a part of the loudspeaker and should be kept in place when listening, they have to be in perfect shape. Without the original grids, the IBLs won't sound as expected. Replacements grids might be expensive. Perhaps the seller didn't have a digital camera or a scanner...but one never knows. Be careful and always ask for a picture that shows all the relevant details: woofer suspension status, tweeter dome and serial numbers. I won't be surprised to see the pics on this article being exploited by some seller. I've also seen an entire part of our articles used as description for an item for sale. Also, always ask for shipping costs. The original IBL box is a single one, quite big and heavy...hence expensive. If possible, prefer face-to-face transactions. Finally, two words about insane prices. After an article on old HiFi gear is published, prices of that item tend to go ballistic. It happened in the past and it will happen again. The cure for this crazy attitude is avoiding to pay too much. One of the pros of buying second hand equipment is low price. As for IBLs, 1000 Euros/$ for a pair of these is simply a pure nonsense. Not for the faint of heart! These IBLs are definitely critical speakers and require intensive system matching research to deliver their best sound. If you are used to the sound of those modern slim floorstanding towers you will find the IBLs simply disappointing. Too different from the current trend, too unforgiving for the average audiophile. BUT! If you are seasoned audiophile, with a preference for mini-monitors, and you simply refuse the idea of using an expensive speaker stand....have a listen to a pair of IBLs. Small, unobtrusive, elegant, precise and trasparent like few others, quick and controlled like nothing else, the IBLs may be the choice of your life. They will able to follow the upgrades of your system, always delivering their classy sound. They're not easy to find, not easy to use and partner with....but they will shine when you'll let 'em conquer your soul. Credits: first of all, Naim Audio UK Richard Dane and Paul Stephenson in particular, for their precious and kind help and for providing a set of Naim NAC A5 speakers cables for testing purposes. Another excellent source of precious infos has been the Pink Fish Media "Flat Earth" website and the related PFM Forum (love you, guys). Very good infos can be retrieved from the official Naim Audio Forum as well (access it directly through the Naim website). Finally, the IBL pics have been kindly supplied by L. Monaco, a truly flat-Earth audiophile. Woofers and tweeters are still available as matched pairs at Naim Audio. The price is EUR ~ 380,- for a pair of woofers and EUR ~400,- for a pair of tweeters. The Hiquphon (http://www.hiquphon.eu/) OW I-92 seems to be a cheaper and better replacement for the ScanSpeak D2008 tweeter. As you have already mentioned, IBL grills are no longer in production. but a replacement can now be ordered at http://www.foamspeakergrilles.com/ Data of the IBL grills are now stored there you can get them there for reasonable money. They fit perfect, look like the genuine grills and let the IBLs look like new. I didn't recognise ANY difference in sound compared to the genuine grills.